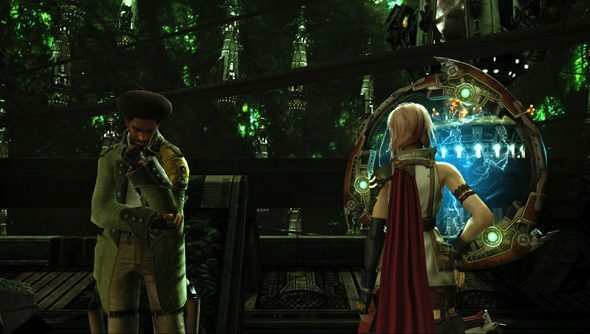 If you can judge a PC port by its graphics menu, Final Fantasy XIII hasn’t got off to a good start. Its game settings page looks like it was designed in the same year as the PlayStation 1 memory card menu, and offers about as much in the way of visual options. Early reports on Steam suggest that the JRPG’s resolution is capped at 720p, with no means to change it – either in the game or in its launcher. Thankfully, Dark Souls tinkerer Durante is on the job. Durante is the man behind Dark Souls’ terribly popular DSFix tool. Evidently drawn by smell of saddened PC gamers, he tentatively entered the discussion about Final Fantasy XIII’s resolution early yesterday morning. “The effort required to do something like this varies massively with how the game was written,” he told NeoGaffers as he pondered a possible fix. Durante left the game’s files to unpack and took a shower. Four and a half hours later, a pre-alpha fix emerged. The new resolution plug-in suffers from a few teething issues: namely scaling problems that can leave the output “less sharp than it should be”, crashes when taking screenshots with GeDoSaTo, and a resolution limit of 3840×2160. But it works. You can buy Final Fantasy XIII on Steam for £10.99, if you were particularly hot on the cinematics in Deus Ex: Human Revolution. Were you?